Backpackers heaved off their weighty packs, exchanged tales of testing bus rides, skimmed through Lonely Planets and made plans. I sat and watched them gloomily, still waiting and still glum because I was still here. As each group came and left I remained in the hostel, hostage by virtue of a swollen knee. Two Polish bikers arrived and they were stuck here too. Their tent had undergone some mini disaster and they were waiting for the Argentinian snail mail to cough up new parts. At least now my life had a focus. I knew that I had to get out of here before the Poles. The race was on. Every day I peeked tentatively under the covers and studied, stretched, flexed and massaged my knee. After a week I decided I could no longer risk postmen, big parcels and jubilant Polish faces. I had to get out of here. 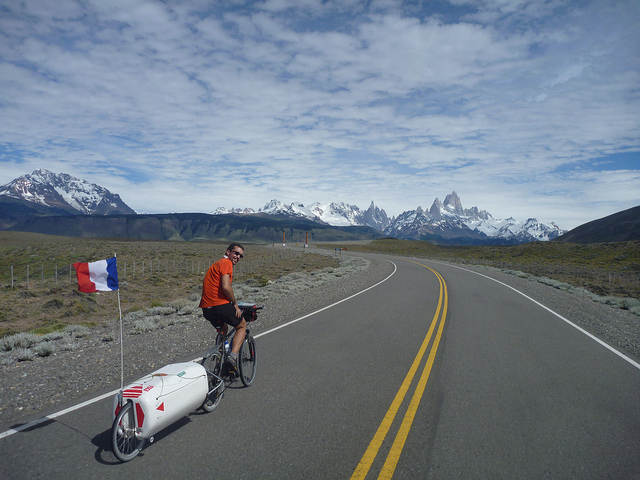 I began cycling out of town, uneasy and unsure, but after the sameness of the plains in the far south Patagonia began flaunting it´s tail feathers, I was entering the realm of the Andes, the longest chain of mountains on earth and my majestic companion for the majority of South America. The Patagonian peaks are a lot smaller in stature than their cousins up north but formidable nonetheless, they glared at me from afar, daring me closer. I soon joined forces with Vincent, a 27 year old Frenchman who carried his luggage in a slick, egg shaped, perfect white trailer. No corners, just curves and a hatch for access. It looked like space age technology. A French flag stood proud and sturdy and in the breeze towards the rear. 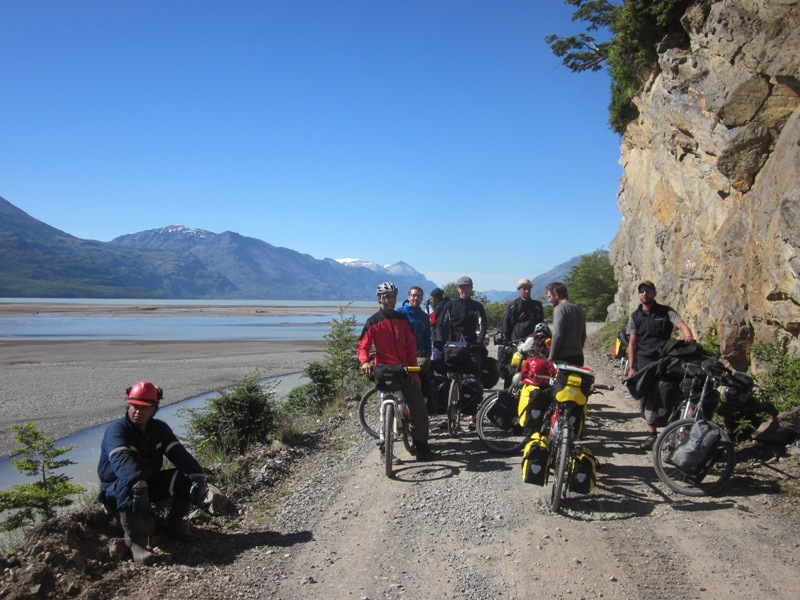 That evening I found myself rough camping with three other cyclists, we were all travelling north and all planning an audacious adventure across a remote border post into Chile. Alongside Vincent and myself was Tim, a conspicuous Dutchman, tall with refulgent yellow panniers, a luminous yellow jacket and an equally luminous grin. The most notable part of Tim´s plan was the absence of one. He claimed no solid time line, direction or schedule. Instead he would simply ride vaguely Northward through South America whilst his money lasted. For Tim this was an insouciant jaunt where the best plan was no plan. The last member of our motley posse was Michel, a sixty two year old Frenchman with the wiry appearance of someone for whom travelling by bicycle has been habit for decades. 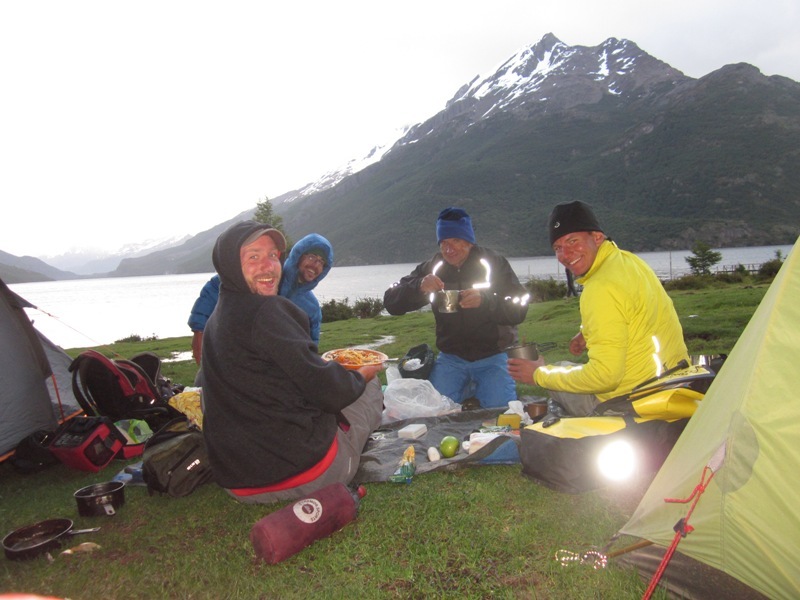 ﻿﻿﻿The next morning we set off early to avoid that gusty menace characteristic of Patagonia. The four of us performed a ballet, tucked into slip streams, shuffling and re-ordering, buoyant and giddy to be riding as a unit. We swept into El Chaiten as condors swooped and glided in elliptical circuits above, the midday sun cast their shadows down to earth, they darted across the ragged terrain like sinister predacious beasts. The knobbly white facade of snowy crags and peaks dominated more and more of my gaze until we were all cowering under their prestigious glint. The sheer granite cliffs of Fitzroy took precedence over the rest, it stood aloof and self important in centre stage, flouting its juts and angles in the glare of summer sun. Mountaineers packed into the town seeking the rare weather window to make a summit attempt, a technically tough climb and a vicious micro-climate make tackling Fitzroy the preserve of only the most experienced climbers. We knew a few bits and pieces about the route ahead, some rough facts gathered from other riders we met coming South. 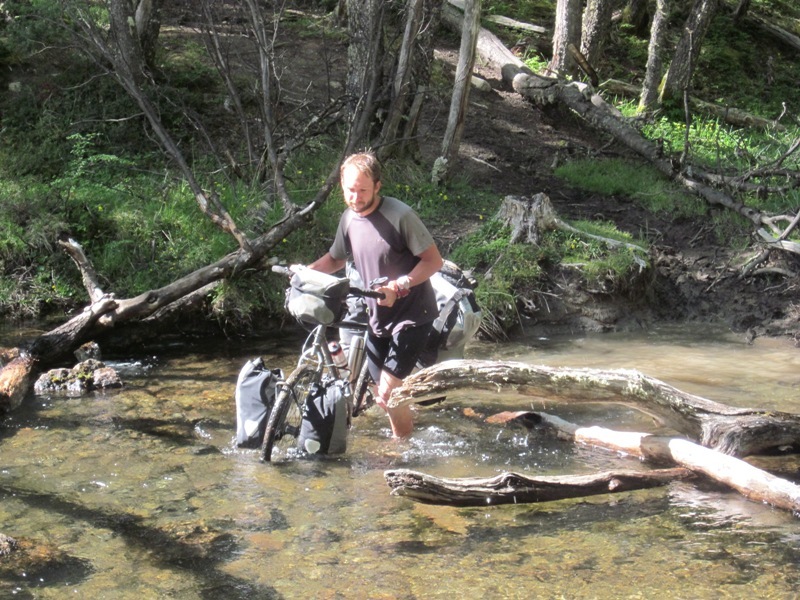 This would be adventure cycling at it’s truest, with all its tests, trials and hopefully, triumphs. Thirty km rough road. Probably very windy. Second boat, leaves twice a week – don´t miss it. Nowhere to get food. Tim and I set out together into violent gales. My weather meter clocked wind speeds of 60 and 70 miles an hour, Beaufort ten, almost hurricane force. We abandoned pedalling but found it tough to even stand in the face of the gale. The road surface became airborne and the stinging particles drove into our faces, it would be a “sand blasting” in the desert, this was a “dust whooping”. Huge ethereal columns of dust surged upwards from the road and raced towards us. The clouds overhead tore across the sky as if someone had pressed fast forward. Luckily the shape of the land began to provide some shelter from the wind, we could ride again and made enough progress to ensure we wouldn’t miss the boat. 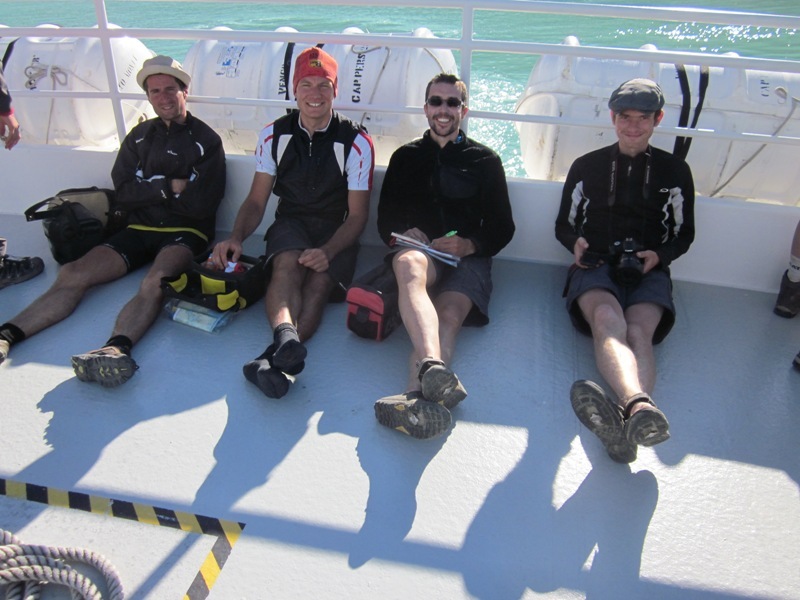 On arrival a local man gave us the grim news – “El Barco” he explained was “Kaput”. This was normal, he divulged, the boat usually breaks down a few times a week. The others arrived and I explained, we were all aware what this could mean. No boat today meant we risked missing the second boat which departed only twice per week. I watched Vincent digesting the news, he shook his head and sighed his frustration. Tim’s grin was replaced by a troubled frown, he muttered profanities in Dutch. My attention shifted to the 62 year old Frenchman, his eyes met mine, he shrugged, grabbed an invisible Senorita and began dancing through the pelting rain with his imaginary girlfriend whilst singing ´La Bamba´. At least we were all in this together. Four more cyclists then arrived, two Brits, a Spaniard and a Romanian, we all began sniffing around for information. At the last minute a van arrived and it seemed, the boat´s captain. Relief spread through the party. We were leaving tonight after all. ﻿﻿﻿Sunlight flooded our free campsite on the lake shore and one by one I watched as another head peered out of canvas, eyes admired the pristine lake and then tentatively glanced at the hills and the daunting prospect upwards. A few of us braved the chill for a quick dip in the glacial melt waters of the lake. A few Argentine backpackers gathered and pointed towards the bobbing bodies in the water, “Mira!… Europeans!” they gasped as if we were exotic creatures. Now we set off through the trees. Over the next five hours we pushed and dragged our loaded bikes through dense bush on narrow tracks and through thick mud, hoisted them over huge dead tree trunks, carried them on our shoulders whilst wading through rivers knee high in water, hauled them up impossibly steep slopes and edged over slippy tree trunks traversing turbulent rivers below. A Slovenian trekker amongst us was the only one to have travelled this route before. He was finding it tough to disguise his glee at our painstaking passage. Perhaps it was because we were new friends and there was some male bonding going on, or perhaps it was simply out of necessity but at times our journey seemed interspersed with moments that belonged to melodramatic war films. Every so often weary legs would lose their footing, another cyclist would arrive at their comrade’s aid, hauling the fallen to their feet and returning to action. In between the groans of effort and dismay emanating from our inching party and the scraping of panniers and rattling of racks came odd music of strange birds, siren-like calls echoed through the forest. Heads low, shoulders hunched, faces wearing the strain but with underlying resolve we moved onwards. It seemed improbable that there would be anything marking the border crossing out here but as we edged over the crest of another hill the words “Bienvenidos a Chile” slowly rose up to meet triumphant yet jaded eyes. There was nothing else here of course, but the sign meant everything. We summoned the energy to pose for the obligatory group shot under the sign, munched biscuits, gulped down water and descended. I passed two cyclists coming up and had to fight the urge to tell them to watch out for “The First Swamp“. After another icy dip in another lake the much heralded boat arrived to take us to Villa O’Higgins and the very beginning of the infamous Carretera Austral. In Villa O’Higgins Tim and I headed off together before the chasing pack. We were both meeting friends in Bariloche for Christmas and so had to make quick ground. I had a dirty secret – the deadline felt good. It’s a romantic notion I can’t fully claim to enjoy – taking off into the wild without deadlines, schedules, routine or constriction. In a life without structure I can’t resist creating some. Tim and I were a good team and rode at a similar pace. Tim was a racing road cyclist in his previous life, competing in La Marmotte in the Alps amongst others. On tarmac climbs he would power past me as I span a slower ascent, but on rough roads the tables were turned and the figure of the tall Dutchman would slowly diminish in my side mirror. Of the many lessons Africa imparted, riding fast for hours on bad roads was a prominent one. Cycling at speed meant of course that when we hit supermarkets the result was carnage. Five minutes after passing through the checkout we would both be sprawled on a bench or just the ground, only metres from the exit and surrounded by empty family packets of crisps and chocolate wrappers with beer cans in hand. On at least one occasion we failed even to make it outside the store before descending into gluttonous scoffage. Serendipity comes with the territory on the Careterra and usually it’s easier riding with a buddy but I am sure Tim´s tendency to tempt fate didn’t always help us on our way. 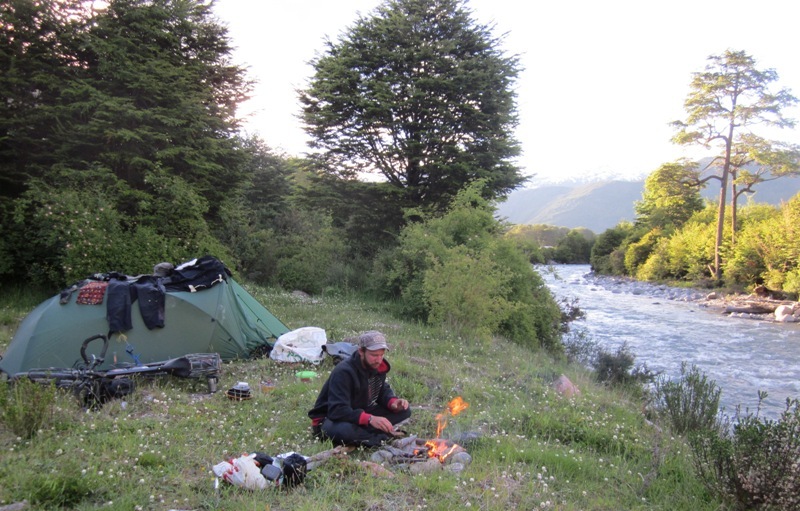 He would emerge from his tent in the morning declaring ´Today will be perfect, I can feel it!´. An hour later, in fierce gales and pelting rain his attention would turn to the graded road ´God this road is great! I bet it stays like this for ages!´. After an hour of bouncing over washboard-like terrain and skidding and sliding over tennis ball sized rocks I would shoot daggers his direction as he sealed our destiny ´Well it has been tough today Steve, but it can’t get any worse tomorrow´. 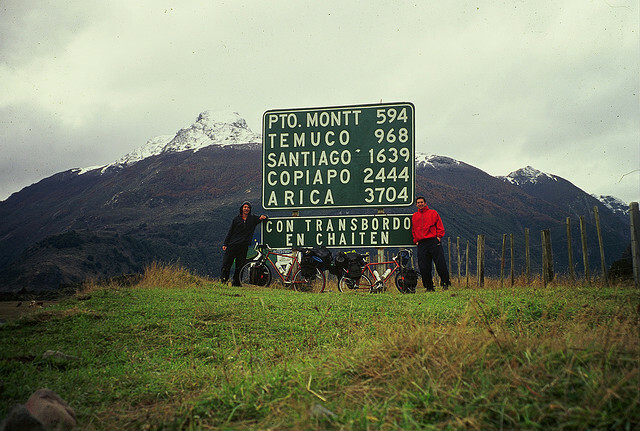 The Carretera Austral was Pinochet’s baby, a rough road connecting the southern settlements of Chile, swinging through thick forests, fjords, glaciers and steep mountains. More than 10,000 Chilean soldiers helped construct the road, many lost their lives in the process. It stretches for over a thousand kilometres and seems to slip perfectly into this pocket of Patagonian wilderness. The Carretera is also something of a bottleneck, cyclists invariably choose this path over the windy and dull alternative through Argentina. It’s the first thread on a spider web and afterwards a multitude of different options branch off, scattering cyclists to different corners of the continent. The route is hardly ever flat, the ups and downs though serve to satisfy every cyclist’s inner masochist. The dips, rises and curves of the roller-coaster make every minute a different one and every corner and crest reveals a new view. Sometimes it felt like I had cycled through a portal, suddenly transported to another distant place on the planet. The road veered around emerald lakes, courted deep blue rivers, bounded over the foothills of glistening, snowy giants and then floundered deep into moist, mossy, deciduous green. Black faced Ibis cawed and Kites and Hawks languidly glided overhead. Some of this won’t last. HidroAysén is a controversial mega project that aims to build five hydroelectric power plants in Chile’s Aysen Region. Two on the Baker River and three on the Pascua River. The project is estimated to flood 14,579 acres of natural reserves. But for us, for now, we could immerse ourselves in nature and we embraced it, cooking over campfires, drinking straight from glacial streams and jumping into icy lakes when we felt the urge. 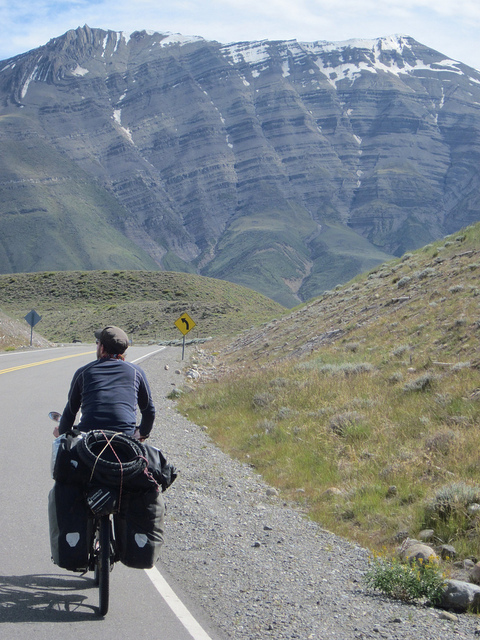 Some of this was familiar, I had cycled the length of the Carretera twelve years ago, as a nineteen year old punk on my Gap year. Then it was April, blustery and colder than now. But there was actually a lot I had forgotten, it made me worry about how much of my world tour I will be able to recall in my dotage. 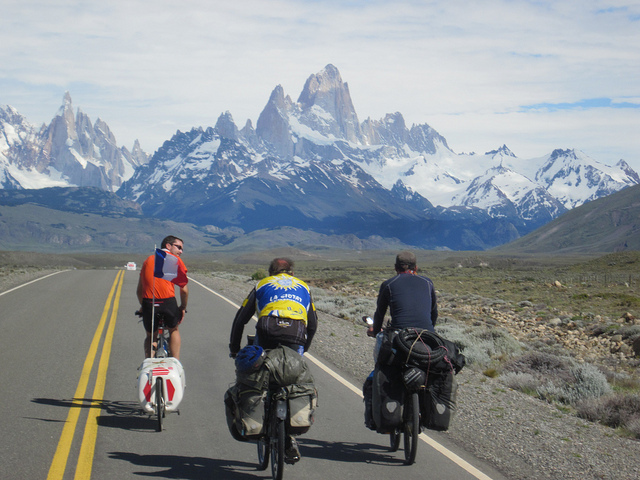 Now it was summer and there were definitely many more cyclists than I remember, and Patagonia was in bloom – lupins painted the surroundings with scintillating, uncompromising hue, the air was thick with the scent of pine and pollen. Only one thing spoilt the party – December and January are months for what locals refer to as the “Tabano” – a biting breed of horsefly. Every day they tracked me up the hills, feeding on me in my weakest moments. ´in case you run out of wax´. This region was cyclist central and every day I rode past a blur of riders taking on the hillocks and troughs. I came across the Lycra clad Speedsters and the ponderous meanderers. I met those on two week breaks from work, others on epic trans-continental expeditions and a few who had pedalled down from Alaska. I came across the super-lightweight and the unprepared and overloaded. I ran into solo riders, couples on tandems, threesomes and cyclists from twenty five different nations (that’s right, I´ve been counting), the cycling-mad French topping the league table. I met trundling pensioners and a couple with a three year old toddler in a trailer attached to Dad’s bike. I met the enthralled, the absorbed and the defeated, a few looked ready for a bus ride home. In a small, inauspicious village along the Careterra was a Casa De Ciclistas. These refuges can be found throughout South America, they are homes whom the owners have opened solely for passing cyclists to spend the night. No money changes hands and nothing is expected in return. There were ten riders sharing the space that evening, we all relished the free shower, the bed and the good company. Hundreds of others have passed through over the years, their scribbles, sketches, cards and photos were crammed inside the guest book. Some wrote poems, one had added an altitude map of the road ahead. There were numerous messages of gratitude to the owner as well as addresses of blogs and websites. Up to eighteen had stayed here on a single night last year. We all crammed inside, loaded bikes were stacked up against each other in the open plan living room, people rummaged for pots and pans, pasta simmered away, stiff limbs were stretched, journals were scribbled in. We shared food, stories, tips and time. Maps were studied and discussed, our futures just lines and dots, soon a picture, later a memory, one of many. Tomorrow we would all leave, the house will be empty again until the late afternoon when more weary bodies in mud splattered Lycra shuffle inside. A few days later Tim and I camped under a bridge to shelter from the rain. We obviously weren’t the first to take cover here either. On the concrete bridge supports other cyclists had drawn simple sketches of loaded cyclists riding through a mountainous backdrop. Like primitive cave paintings by hunter gatherers they had documented their presence for others to see. The Carretera stunned and challenged us all over the next couple of weeks. Tim and I rode through nasty bouts of gastroenteritis, the Spaniard’s chain snapped twice, Michel’s bike would suffer a major technical problem and he would have to hitch hike north, the Tabano seemed to have a particular taste for Romanians and of course Vincent had to endure constant taunts about his shiny, hairless legs from cyclists coming in the other direction. The next bit, strangely, I remember in detail from my time here twelve years ago. Queulat – a lush rain forest decorating the Patagonian Andes in which waterfalls drape from virtually every cliff face. The Queulat icecap and associated glaciers lie high and deep amongst the peaks. It rained of course, it usually does, some parts have 4000 mm of rainfall annually and over 300 days of rain per year. In 1766, the Jesuit Father José García Alsue explored the area searching for The City of Caesars, a mythical and enchanted city which was purported as having mountains of pure gold and diamond. Instead he found Queulat and almost certainly got a drenching for his trouble, though for me there really was mystery here and slowly it all began to come back to me. The roadside was as dense as I remembered with understories of bamboos and ferns and every vista dominated by evergreen trees and the huge exotic leaves of Chilean rhubarb, two metres in girth. I remembered too the sudden, sullen, all-encompassing envelope on entering the forest, I remembered the ashen clouds loitering unnaturally low, waist high to mountains and ephemeral rainbows. I remembered how the waterfalls looked like twine, tethering a huge unsullied white tarp of snow to mountain tops. And I remembered the all pervasive sounds of moiling water, the trickle and gush of a thousand creeks, rivers, brooks and streams. Finally… I need a new IPOD this Christmas so if you feel like helping me out by way of a belated Christmas present, even though I got you precisely zip this year, please check out the right hand column of this blog where you should find a blue button where you can donate just three pounds to help me get some music back in my life. Ah, pup. You continue to amuse and amaze us, here in Northern Minnesota. All good energies to keeping that damn knee in working shape…and to a new iPod entering your life. All of this without music? Oy.